As a lover of history, I have always been interested by ancient cultures, and the Khmer civilization of Cambodia has particularly fascinated me with its legendary Angkor ruins and temples, the largest religious shrines in the world. Long had these been marked on my Inflatable World Globe as a must-see destination, but it wasn’t until last year, however, when I finally managed to convince my wife to let me fly to Cambodia — alone. That’s right, alone in Cambodia, only with my backpack and credit card. Why alone, you may ask? I always knew I had a bit of Indiana Jones in me. 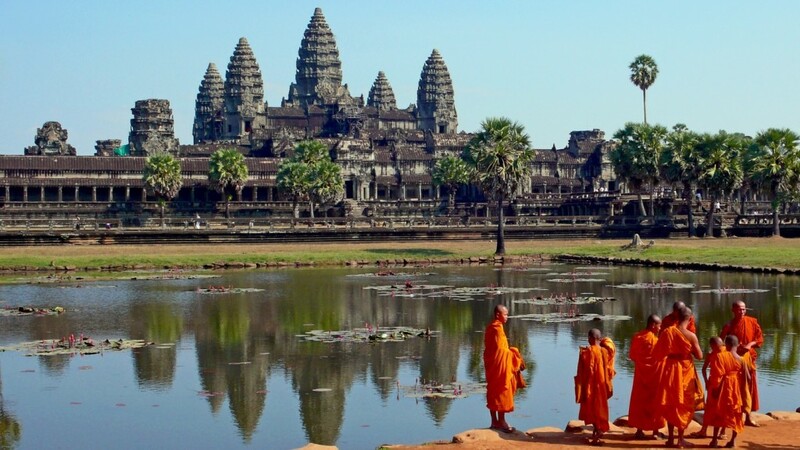 Besides, I needed no distractions: I wanted to spend every single day of my two-week long stay exploring the world-famous Angkor temples, not bumming around on some beach or hotel swimming pool. I arrived in Siem Reap in mid of November, when I knew the weather would be comfortable, with a good humidity, moderate temperatures, and mostly sunny days. The Cambodian Language Course I followed earlier that year came in handy right away, helping me find my way around the bustling city, whose light and elegant Chinese-style architecture surprised in many ways my Western eyes. For a few dollars (no conversion necessary, since the US dollar is in Cambodia the business currency) I managed to rent a tuk-tuk, a kind of rickshaw with a motorcycle front and a nice 360 degrees view from the back. The tuk-tuk drove me to the Psah Chas old market of Siem Reap, where you can buy anything your heart desires, from exotic fruits and goods to comfortable clothing. For my part, I purchased such provisions as I needed for my extensive stay, as well as a fresh honey hive (delicious!). By the time I was done I was quite hungry, so I stopped at one of the many eating places in the area and ate two foods I had long dreamed of, a Kuy Teav, a noodle soup made with pork broth, and then what is widely regarded as the national dish of Cambodia, fish amok, a kind of fish curry made with coconut milk, which I ate from a banana-leaf cup. 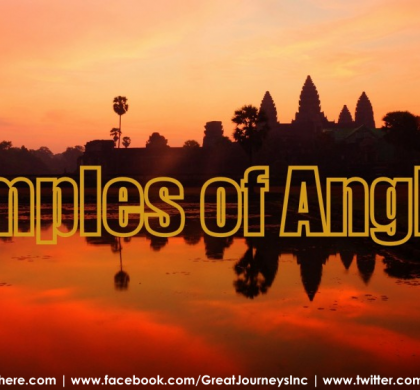 By the time I had settled in my room at the nearby Villa Siem Reap, evening had fallen, and I began carefully preparing for my Angkor adventures, which were to begin tomorrow morning just outside the city. 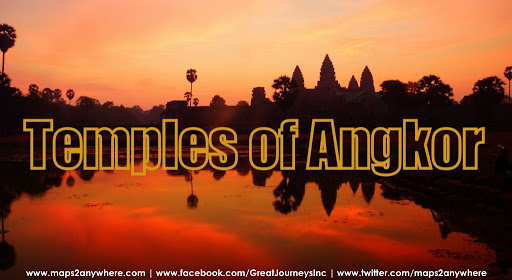 The Angkor Temple region stretches over hundreds of kilometers, and while I knew I couldn’t see it all in just two weeks, I managed, using Siem Reap as my base, to cover a lot of ground. Over the next two weeks, a thousand years of Khmer heritage unfolded around me, wonderful temples ranging from paltry ruins to gargantuan constructions, upon whose once sacred shrines the wildness of the jungle had encroached over the centuries. I can never forget the jaw-dropping sight of the fabulous Angkor Wat temple with its five soaring towers, and its majestic reflection upon the sublime Tonle Sap Lake. Or the giant, uncanny faces I photographed on the front of the Bayon temple, or my unnerving wanderings through the mysterious Ta Prohm Temple, built deep into a jungle, amid kapol trees which seem to hold it in place like the tentacles of some great earthly monster about to spring from the ground, or the breathlessness with which I climbed the Mayan-like pyramids carpeted with greenery which squat upon sacred Cambodian soil in the temple complex of Koh Ker. 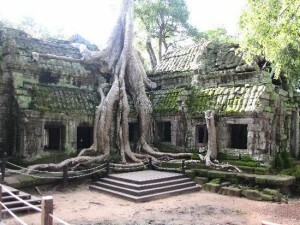 I needed a long time to process all the ancient wonders I had seen near Siem Reap, and if it were not for my photos, videos, and drawings, I doubt that my family and friends would have believed my stories. My trip to Cambodia was indeed the trip of my lifetime, and I returned home a changed man. 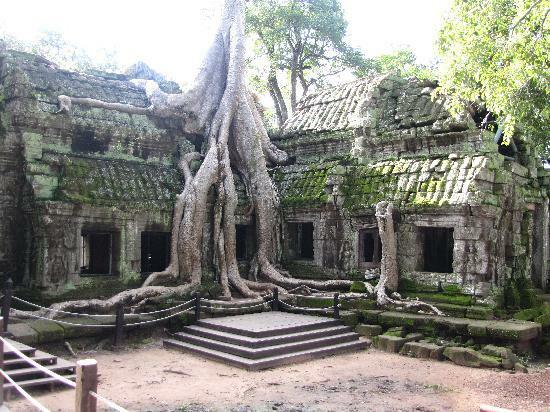 I don’t know where you live, or how much your partner enjoys faraway destinations, but I wholeheartedly recommend the Angkor temples near Siem Reap in Cambodia, especially if you sign up before your adventure for a Cambodian Language Course.